I recently purchased, at a big discount, SKARLES Backseat Car Organizer. I have to say it has made a big difference in the way my mini van looks inside. It's nice and big, but not too big. It measures 23 in long and 15 in wide. Plus it has a slim profile to give your back seat passengers plenty of leg room. 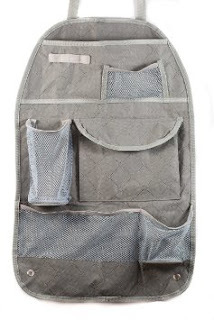 It has 3 mesh pockets and 2 velcro pockets to organize large and small items. It installs quickly and easily. Just attach to the headrest with the adjustable buckle attachment straps. It easily swings from the front seat to the backseat to keep things organized and accessible. Whether you're hauling kids or just yourself there's plenty of room for anything from diapers and sippy cups,and toys to Ipads, tablets, book, whatever. It's a nice looking organizer. It's gray, very neutral, and fits in just about any car, truck, van, mini van or SUV. I think it would make a great gift too. Who wouldn't love the gift of organization? I should probably have one on each of my front seats. I received this product at a greatly reduced price in exchange for an honest unbiased review.